Conservationists have expressed their amazement that thousands of rare dolphins have been found in Bangladeshi waters when previously they were thought to be endangered or dead. Nearly 6,000 Irrawaddy dolphins were discovered in freshwater regions of Bangladesh's Sundarbans mangrove forest and the nearby waters of the Bay of Bengal, the New York-based Wildlife Conservation Society (WCS) has said in a report. The WCS says that up until now the largest known populations of Irrawaddy dolphins - which are related to orcas or killer whales - numbered in the low hundreds or even fewer. The Irrawaddy dolphin grows to up to 2.5m (eight feet) in length and frequents large rivers, estuaries and freshwater lagoons in south and south-east Asia. 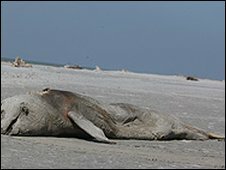 The WCS says that its latest survey was conducted using rigorous scientific techniques and is grounds for cautious optimism that Irrawaddy dolphins could be enjoying something of an Easter revival. 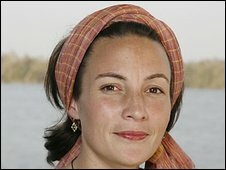 But how is it that an animal once thought to be in danger could in fact be thriving - and surviving swimmingly - in outlets adjoining the Bay of Bengal? "There are lots of areas - especially in Asia - where we have very little idea about the species occurrence and status of cetaceans [whales, dolphins and porpoises]," says Brian Smith, the lead scientist for the Bangladesh Cetacean Diversity Project. "It is a matter of a lack of research, funding and training of local scientists. Because cetaceans are so popular, many people think that their biology and conservation status is well known. "To a large degree this is true in the West, but there are huge gaps in our knowledge about these animals in developing countries." Mr Smith says that there is now "a race to discover intact populations of dolphins, whales and porpoises where early conservation interventions can be effective". "This must happen before the situation becomes dire and species fall into what has been described as an extinction vortex. That is one of the primary lessons of the probable extinction of the Baiji or Yangtze River dolphin [in China]," he says. Dr Smith stresses that the discovery of so many Irrawaddy dolphins can give a false impression that these animals are no longer in danger. "While it is certainly encouraging and a cause for celebration, there are a number of threats, including declining freshwater supplies and rising sea-levels from global climate change that could quickly overwhelm even such a large population," he cautions. Even now, scientists say they do not know exactly how many Irrawaddy dolphins remain. In 2008, they were listed as vulnerable in the International Union of Conservation of Nature's Red List based on population declines in known populations. Work on the ground to protect the dolphins is being spearheaded by a number of conservation groups, including the WCS's Elisabeth Fahrni Mansur. "We are just starting to study and understand the diversity and abundance of dolphins in Bangladeshi waters," she told the BBC from her office in Dhaka. Because no definitive survey of dolphin numbers has ever been completed in Bangladesh, estimates of their numbers can vary enormously, she says. "While these numbers appear high and are a welcome boost, the numerous threats they are facing remain a great concern, as they could reduce the populations dramatically within a short time. "It is therefore of great importance to find feasible solutions to reduce these threats in collaboration with all concerned authorities and local fishing communities by creating a network of protected areas to ensure their survival." 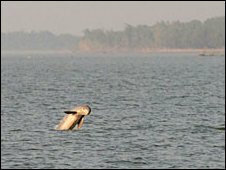 Conservationists say that freshwater areas near the Bay of Bengal are "a hotspot" for endangered dolphins. But they face two great risks - pollution and fishing nets. "Accidental entanglement in fishing gear and the ecological changes caused by declining freshwater flows and climate change are problems that we must address to ensure their future," says Ms Mansur. "If we act now and work actively together towards reducing the threats they are facing, there is a good chance to ensure the survival of the globally significant Irrawaddy dolphin population in Bangladesh." She argues that by establishing a sanctuary for dolphins in Bangladeshi estuarine, coastal and deep-sea waters, it would be possible over time to see how badly these animals have been affected by the impact of declining freshwater flows and sea-level rises. "If we are able to do this, we may have more pleasant surprises over their numbers in the future," she says. How are species classed as extinct?